"Shakne sabko jakda hai, sach ne sabko pakda hai, bachna sabko mushkil hai, sabka sabse lafda hai," is what the new song from AndhaDhun emphasizes. After the intriguing trailer of AndhaDhun, the makers have now released the first track from the film. AndhaDhun title track is not a conventional Bollywood dance number yet it makes for an impressive foot tapping song. The title track has been sung by Raftaar and features Ayushmann Khurrana, Radhika Apte and Tabu. Amit Trivedi has composed the music while Girish Nakod has written the lyrics for the track, which is indeed quirky and unusual. 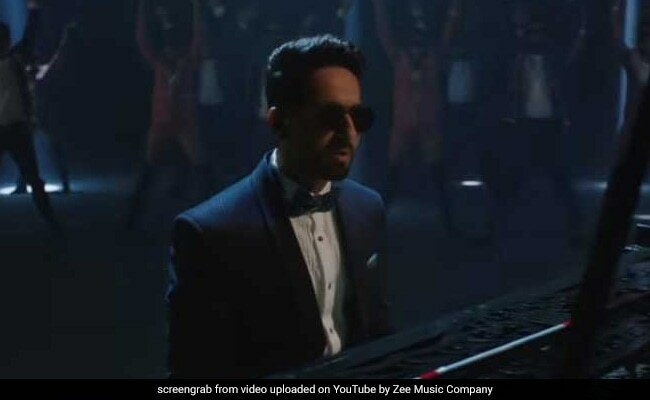 The song opens with Ayushmann Khurrana playing the piano. Tabu and Radhika Apte enter later in the frame. Take a look at AndhaDhun song here. The makers released the new poster of the film recently, which features the lead pair Ayushmann and Radhika Apte. Ayushmann can be seen walking with a stick while Radhika Apte can be seen holding his arms. Sharing the film's poster on different social media platforms, Ayushmann wrote: "He stumbled upon love. She fell in it. What does fate have in store for them? Watch AndhaDhun in cinemas on October 5 to know. Trailer Out Now!" The makers of AndhaDhun did not go by the usual norm of releasing the trailer during the daytime or evening rather they dropped the trailer at midnight. The trailer went crazy viral and it has over 15 million views on YouTube. AndhaDhun is a murder mystery, which has been directed by Sriram Raghavan.